The oblong scarf measures 13 x 60. It contains a combination of colors including ivory, taupe, sage, olive green, light brown and navy blue. 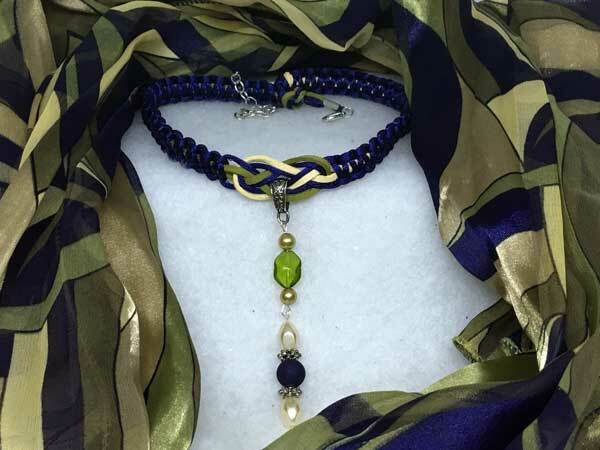 This corded necklace is made using satinique cord in combination with suede cord. The length can vary from about 16 to 19 inches with a center jeweled piece that adds 3.5 inches. It is done in ivory, navy and olive green. The jeweled piece starts with a twisted glass piece in olive green, surrounded by 2 taupe pearl rounds. Hanging separately is a navy blue round with a matte surface, surrounded by 2 beautiful, faceted, ivory pearl ovals. They are separated with silver spacers.